Asteroid 2010 TK7 is the first Earth "trojan" asteroid to be discovered. As shown in the second part of the clip, there is an interesting long-term libration around Lagrange points L4 possibly extending to L3. I have tried myself to plot the relative position of sun, earth and asteroid 2010 TK7 in the last 7000 years in order to have a better visualization of the whole libration movement. In a frame of reference co-rotating with earth, sun is at coordinates (0,0) and earth is fixed, let's say at coordinates (1,0). So we can see the so called "tadpole" orbits around L4 (red). If the graph is correct, in the past, there had been "tadpole" orbits around L5 (blue) as well. Furthermore, there has been a period when the asteroid librated along the so called "horse-shoe" orbit. 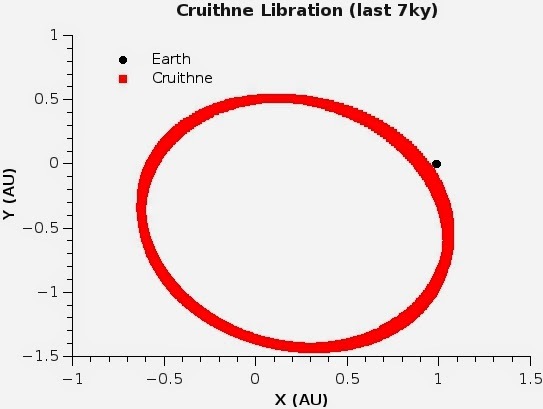 Just for comparison, let's do the same looking at the libration movement of asteroid (3753) Cruithne. 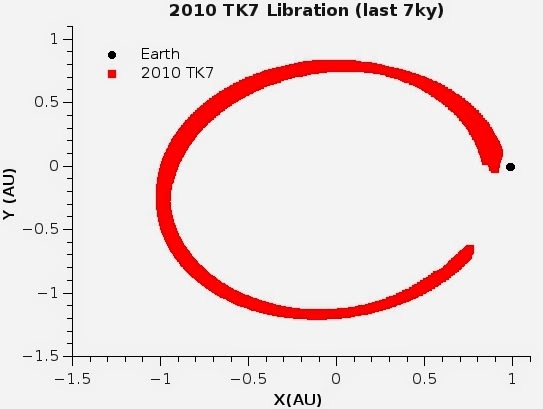 If correct, the result seems to say that the orbit of Cruithne is much more stable than that of 2010 TK7 (no tadpole and no horse-shoe orbit is displayed in most parts of the period in analysis) even if there had been a couple of times when the libration movement did changed direction somewhere on the L5 side.